Cosey Homes is an established surveying practice with a team of highly experienced chartered surveyors, offering expert surveying services and other property related services to clients across the North of England. 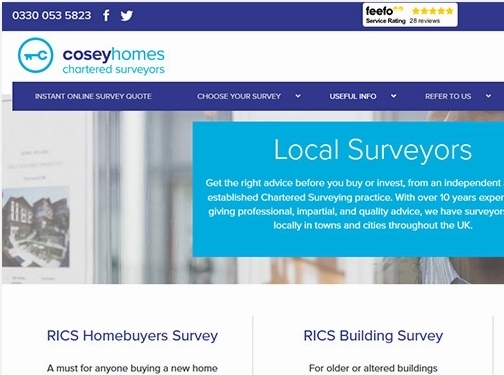 With offices in St Helens, Merseyside and Leeds, Cosey Homes provide personalised, knowledgeable advice on the best type of survey to suit your needs. The Cosey Homes team are strategically placed to cover towns and cities throughout the North of England, with experience surveying properties in Stockport, Bradford, Doncaster, Wakefield, Huddersfield, Yorkshire, Lancashire and the surrounding area. Services provided include the RICS HomeBuyers Survey, the RICS Building Survey, RICS Condition Report, Residential Valuations and Commercial Surveys and Valuations among others. Cosey Homes are accredited by some of the industry’s highest standing professional bodies RICS, CABE and CIOB, giving all clients peace of mind when requesting an in-depth survey or report from the team. Whether you required a Commercial Valuation Survey in Leeds, or a Specialist Building Report in Blackpool and further afield, Cosey Homes can help. Visit their website for more information, or get in touch to speak with a member of the professional team today. UK (HQ'd in St Helens) based business - established in 2003, and with 21 branches throughout the UK - providing chartered surveying services. Website includes details of services provided, "meet the team" information, testimonials, full contact details including company registration and VAT numbers.